If not successful, may repeat 12 mg rapid IV. 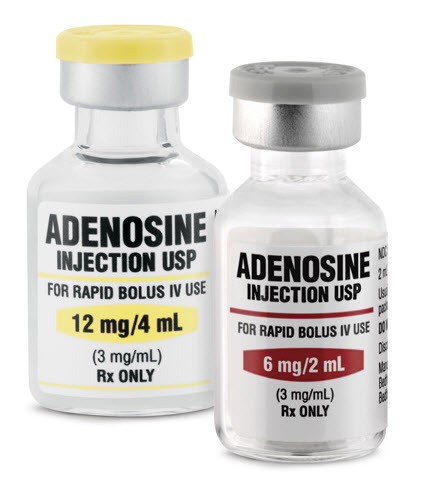 All doses of Adenosine are followed by 20 ml bolus of NS. Go directly to 12 mg if patient with history of PSVT advises it takes 12 mg. May repeat x one. 0.1 mg/kg rapid IV followed by 10 ml rapid saline flush. Max single dose 6 mg. If unsuccessful, 0.2 mg/kg rapid IV followed by 10 ml rapid saline flush. Max single dose 12 mg. May repeat x one. Lightheadedness, paresthesia, headache, diaphoresis, palpitations, chest pain, hypotension, shortness of breath, transient periods of sinus bradycardia sinus pause, or asystole, ventricular ectopy, nausea, metallic taste. May produce bronchoconstriction in patients with asthma and in patients with bronchopulmonary disease.